SYNOPSIS (Courtesy of IMDb): A romantic police captain breaks a beautiful member of a rebel group out of prison to help her rejoin her fellows, but things are not what they seem. Strengths: It’s all about the images and action. And that’s all right because they’re consistently entertaining — and occasionally sublime. 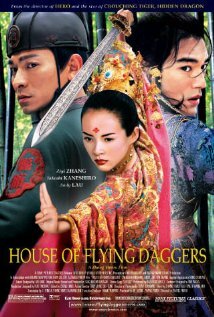 We’re talking moments of such ecstatic imagery that you think, “This is why film was invented.” (Imagining House of Flying Daggers as a novel is no fun.) The physics-defying combat scenes are vividly kinetic, and Zhang even bends the weather to his will, summoning snow that makes no logical sense but whose beauty trumps all reason. Weaknesses: The film is a collection of frequently brilliant action scenes connected by a comparatively dull romantic-triangle storyline, and there’s always a loss of energy when the characters stop moving and start talking. These “drama scenes” are beautifully photographed, like everything else, but the film’s emotions are never as vivid as its colors, and the choreography of romance never matches the choreography of battle. Characters/Performances: The three leads are competent dramatic actors, but never rise above the material. Like dancers in a musical, though, the strength of their line readings matters much less than the grace of their movements, and they each deliver the goods. Of the three, however, Ziyi Zhang is easily the most striking — lovely and mesmerizing and so badass. If I ever have to get beaten senseless by anyone, please let it be Ziyi Zhang. See Also: Zhang Yimou’s very different Not One Less, which I watched on Day 24. Not a sword or exceptional hue to be seen, but a strong film. As I continue with this blog, I intend to take a look at Ju Dou, Raise the Red Lantern, and Hero, all of which I’ve previously seen and loved (especially Ju Dou). Best Moment: The sequence in the bamboo forest has forever altered my relationship with the color green.